The workplace in the digital age is undergoing transformation. Wirearchy is at the heart of this transformation. You may not yet be familiar with the term, but you are very likely already experiencing wirearchy to some degree. 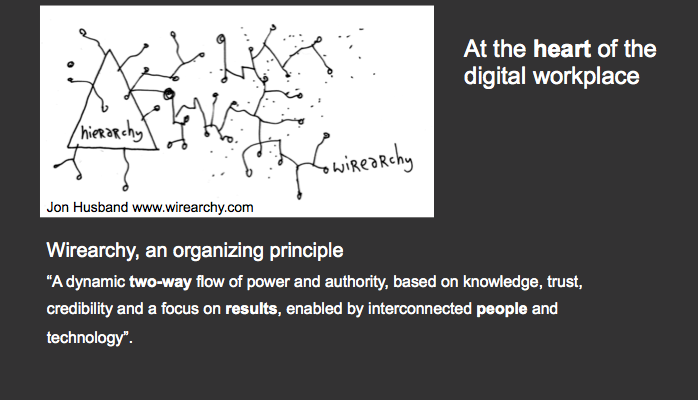 Jon Husband created the term over ten years ago and defined wirearchy as: “a dynamic two-way flow of power and authority, based on knowledge, trust, credibility and a focus on results, enabled by interconnected people and technology”. I have conducted research on the internal digital work environments of organizations for nine years, starting in 2006. Each year I publish data and analysis based on input from several hundred organizations around the world. A multi-year perspective shows that organizations are moving towards ways of working that reflect the principle of wirearchy. Digital is a new way of working. It simplifies. It accelerates. It clarifies. It humanizes. Technology is only a small part of the digital way of working. Most people misunderstand this. They think “technology” when you say “digital workplace”. The digital workplace framework created in 2013 and described below is based on “the intersection of People, Organization and Technology”. 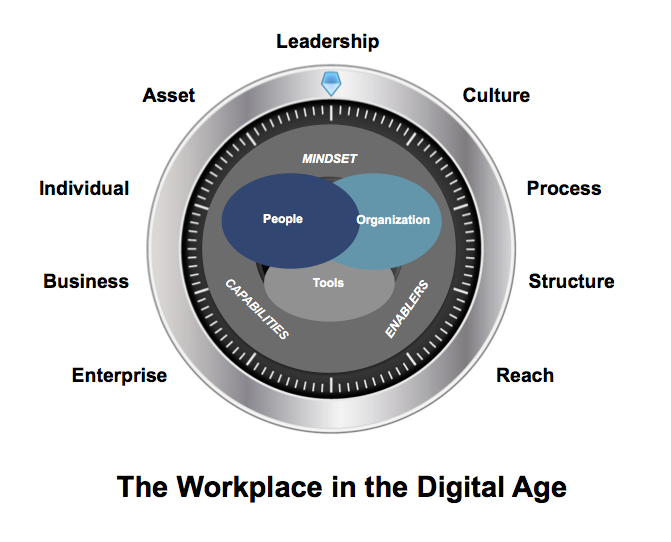 In fact, it is more accurate to talk about the “workplace in the digital age” rather than the “digital workplace because there are key dimensions that are not digital in nature even though they are facilitated and enhanced by digital. A maturing digital workplace enables individual voices to be heard. Basic as this sounds, it has not always been the case. Clients and external partners are being integrated into maturing digital workplaces. Previous internal-external barriers are decreasing. People self-declare and enable others to find them and connect. Communities balance hierarchies. Community management is becoming an official role. New processes accelerate problem-solving and lead to new practices. The internal digital divide is slowly disappearing. More people can reach and be reached. Decision making about the digital workplace happens at both executive and operational levels. Cultures in organizations with maturing digital workplaces are open to experimentation and entrepreneurship. When it comes to getting results, leadership from the top of the hierarchy is not always the most important. 1. A maturing digital workplace enables individual voices to be heard. Basic as this sounds, it has not always been the case. Individual Capabilities: Creating, sharing, interacting, belonging, contributing, learning and growing. I wrote a Manifesto for self expression inside organizations a year ago based on data from my annual global digital workplace surveys. Today, globalization is bringing even more people around the world to work together in a digital workplace. The capability of self-expression is digital since, in most cases, people who work closely together will not ever meet face-to-face. People need to share their information and knowledge without going through official publishers. They need to work with other, co-creating content. They need to be able to react to others and comment on the work of other people. These capabilities have increased significantly over the past six years as illustrated in the chart below. 2. Clients and external partners are being integrated into maturing digital workplaces. Previous internal-external barriers are decreasing. Business Capabilities: Serving clients, customers or users of the organization’s services and products. Data from the most recent digital workplace survey show that twice as many organizations with maturing digital workplaces have official collaboration spaces online so that people in their organization can work interactively with external people including partners and customers. Over half have their own internally hosted spaces where they invite externals to work with them. This is the beginning of extending wirearchy beyond the organization itself to include partners and customers in their eco system. Organizations with maturing digital workplaces also have more communities where internal and external people work together. 3. People self-declare and enable others to find them and connect. Enterprise Capabilities: Cooperation and collaboration in all directions throughout the organization. People can find other people without know their names by searching on key words in self-declarative people directories. Over 80 percent of maturing digital workplaces have this capability enterprise wide compared to 30 percent of the majority of organizations. 4. Communities balance hierarchies. Community management is becoming an official role. Structure: Virtual operational units that complement hierarchy: teams, communities and networks. Communities play a strong role in organizations, providing cross-organizational forces that complement hierarchical authority. Organizations with maturing digital workplaces that having many more cross-organizational communities than do the majority of organizations. These communities, usually self-organizing around topics or purposes, play different roles ranging from managing projects, curating content to proactive work on strategic business topics. Community management has been made an official part of peoples’ jobs in 15 percent of organizations with maturing digital workplaces. Only 2 percent of the majority of organizations have done this. 5. New processes accelerate problem-solving and lead to new practices. Process: Both new and improved processes integrating social, collaborative ways of working. People across the organization can propose ideas in response to a problem-solving challenge. 43 percent of maturing digital workplaces versus 14 percent of the majority report having this capability enterprise wide. When we include the figures for “deployed in some parts of the organization” the difference is even more striking: 70 percent versus 31 percent. Not surprisingly, just over 30 percent of survey respondents in early adopter organizations report transformational or significant impact on ways of working. The equivalent figure for the majority is 12 percent. 6. The internal digital divide is slowly disappearing. More people can reach and be reached. Reach: Connecting everyone in your ecosystem anywhere, anytime and ensuring equal, relevant, interactive access to each other. 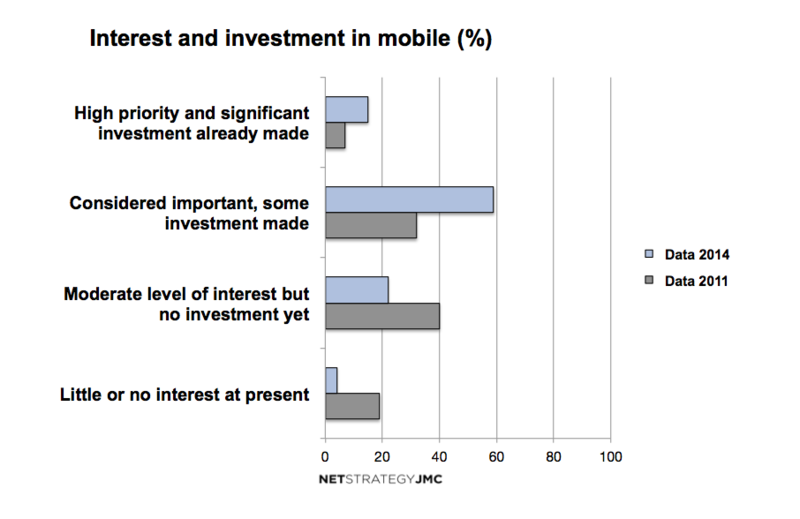 Interest and investment in mobile has doubled over the last four years with 15 percent of the survey population saying they give it “high priority’ and have made “significant investments”. This figure was 7 percent four years ago. 7. Decision making about the digital workplace happens at both executive and operational levels. Strategic Asset: Managing the digital workplace as strategic and essential for the organization. Decision-making is influenced by wirearchy in that the traditional top-down command and control way of working is reaching its limits. This shows up clearly in the organizations with maturing digital workplace where participation in strategic decision-making about the digital workplace is higher at operational levels where 73 percent are “very” or “moderately” involved compared to 62 percent in the other organizations. Interestingly, top management involvement is also higher in the maturing group where 79 percent of C-level participate compared to 48 percent in the other organizations. 8. Cultures in organizations with maturing digital workplaces are open to experimentation and entrepreneurship. Culture: Attitudes, behaviors and expectations in an open, participatory work environment. Organization with maturing digital workplaces tend to have cultures that are more team-oriented, enable people to experiment and take initiatives. Mistakes are considered opportunities to learn. Information systems in these organizations reflect the culture and tend to be more open with less restricted access. The blue line in the chart represents the organizations with maturing digital workplaces; the gray line represents the majority. 9. When it comes to getting results, leadership from the top of the hierarchy is not always the most important. Leadership: Influence from any level and from any part of the organization that results in change. The recent digital workplace survey described four business scenarios in the form of questions, and asked participants to indicate which factors had the greatest impact on their outcomes. Involvement and behavior of senior leaders and Communities and social networking were among the top factors. 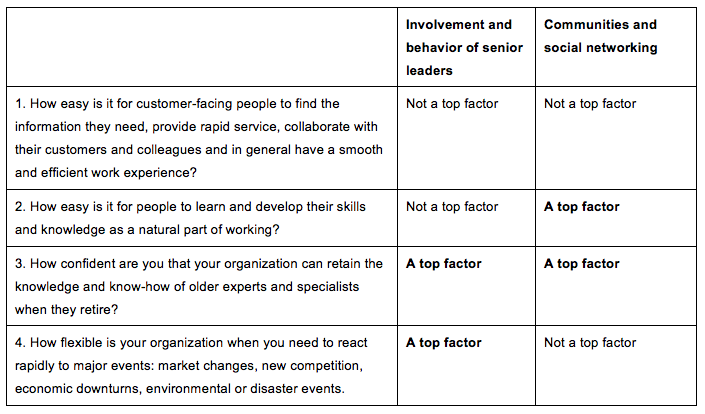 The table below compares only these two factors listed. Others such as information management and real time communication have impact, but the focus here is on the two leadership factors: from the top and from cross-organizational communities. Let’s summarize by returning to Jon Husband’s definition and we will see that each of the nine dimensions of the digital workplace framework impacts and is impacted by wirearchy. The data shared in this article touches on a few aspects of wirearchy. I would advise you, in your own organization, whatever your role is, whatever “level” you are officially at, to remember the beginning of the definition. It is the starting point for the rest: “a dynamic two-way flow of power and authority”. If you can make that happen, even in very small ways, you’ll be moving in the right direction. * Maturing digital workplaces are the top 20 percent of participating organizations based on scoring resulting from self-assessment by the organizations themselves. With the exception of the Culture chart above, the data is from the digital workplace survey conducted between October 2014 and January 2015. The data in the Culture chart is from the previous year, collected at the end of 2013. First published on Pulse 15 Jan 2015: Wirearchy in the Workplace.